I am a true believer in the power of FAMILY…specifically Word Families. In my own classroom, it’s an essential part of my Daily 5 Word Work. Word families, or some people call them chunks (families is just so much more friendly sounding to me but to each their own), help readers look for patterns when decoding. 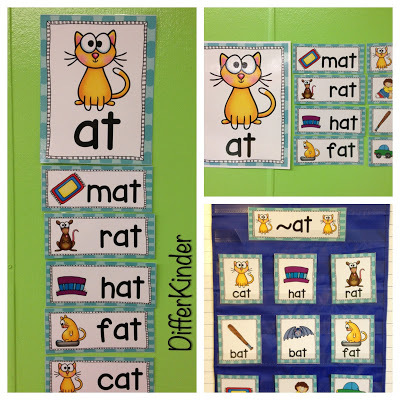 When your students recognize those patterns, they can more easily sound out words they don’t readily know. It is always amazing to watch when a light suddenly turns on as a students starts decoding with the help of word families. I think they surprise themselves as much as they surprise us. I won’t soon forget hearing one of my most struggling kinders this year, yell across the room at me in the middle of one of our first Ball Word Celebrations. “Hey Mrs. McGuire, I just read KitKat. Kit is part of the ~it family and Kat is part of the ~at family. I read that! !” Confidence, independence and joy…pure joy is what they experience when they ‘get it.’ So yes! 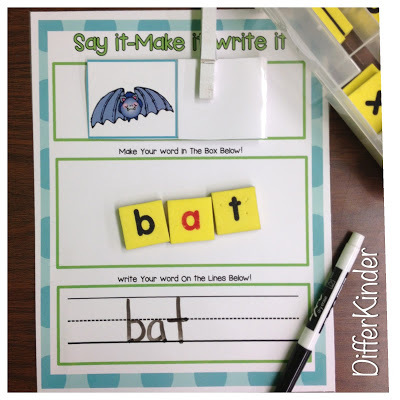 I spend a ton of time practicing and using word families with my kinders. 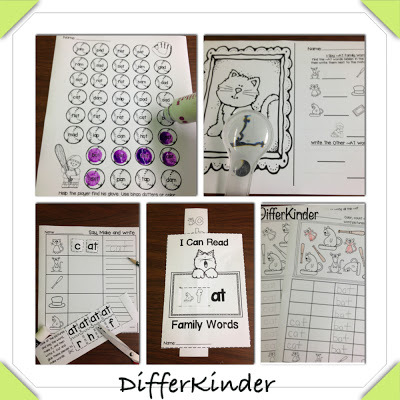 We have a routine of whole group, small group, center and independent practice activities that allow my kinders to get plenty of practice and familiarity with the word families. 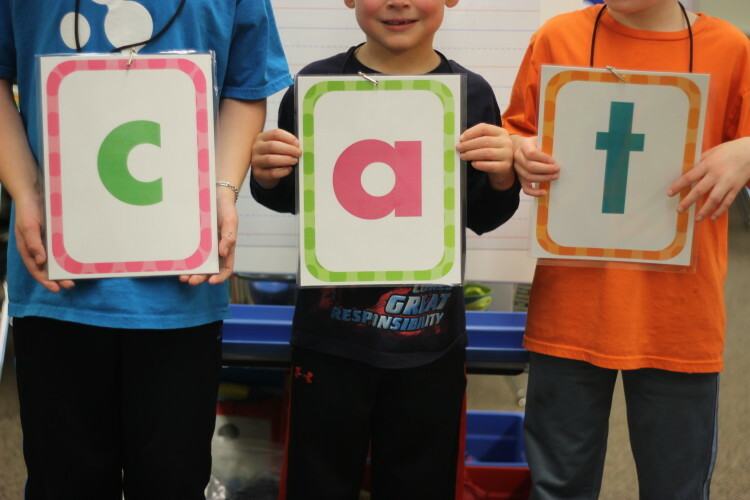 Monday: Introduce word family words as a class and make words using letter placards. If at all possible, I like to give my kinders plenty of opportunities to move and this Is a great kinesthetic activity. By the way, if you don’t have any letter placards, you can get a FREE set HERE and learn how to put them together. Wednesday: Mini-lesson-Students find all the ‘word family’ words hidden in my morning message. 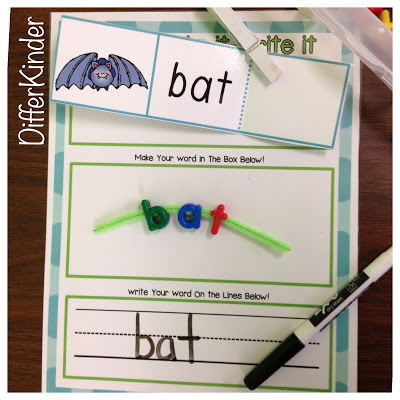 I have students come up and underline, circle with wikki stix, use a pointer or flyswatter to identify word family words. Thursday: Mini-Lesson-I call out word family words that may or may not be part of that week’s word family. If it is, then students perform a specific physical act like standing up, raising an arm, lifting their right leg, waving hello…It feels like Simon Says because then can only perform the act IF the word is part of that week’s word family. My goal for whole group mini-lessons like this is always to give my students a chance to move. 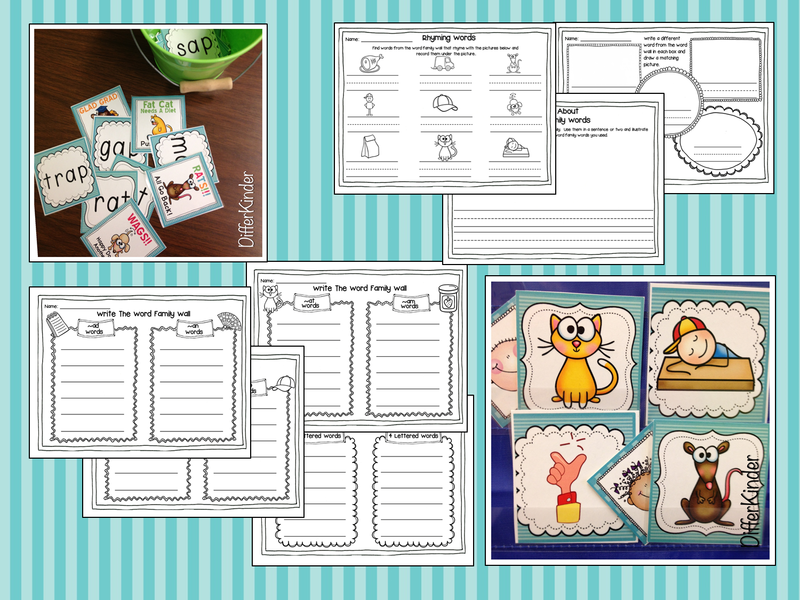 To support the whole group lessons, I provide extra practice for each new word family in small group and independent Daily 5 stations. 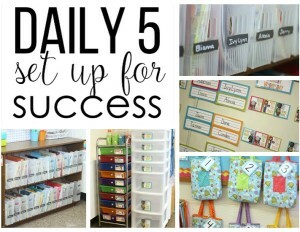 I usually introduce these activities the first several weeks to my students in small group before placing them in my Daily 5 Word Work Station. 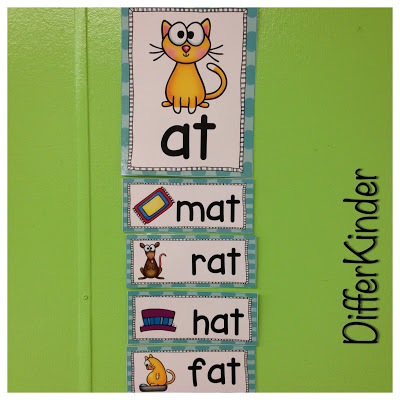 But after I’ve introduced several word families, most students can use these independently. 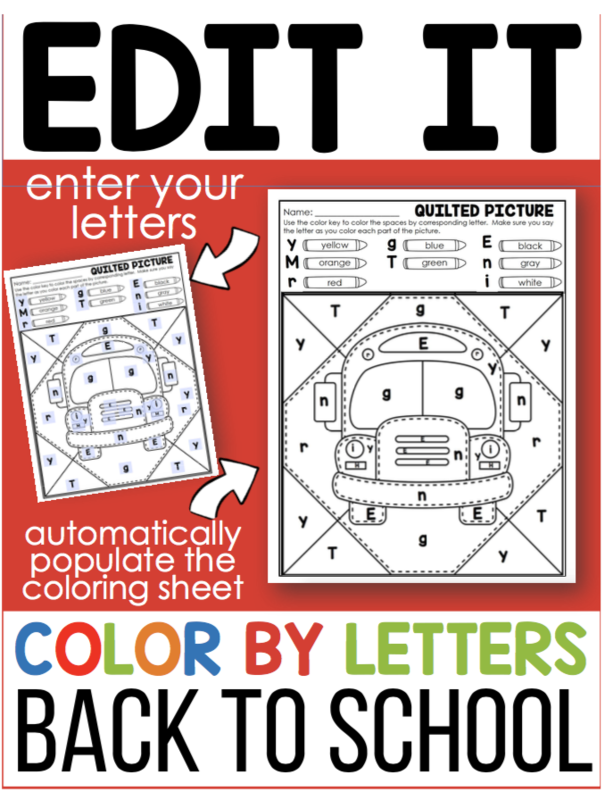 Play-doh stampers or whatever letter manipulative you would like to offer. Differentiating can be accomplished by giving your students choices. Here’s one way to make that happen. 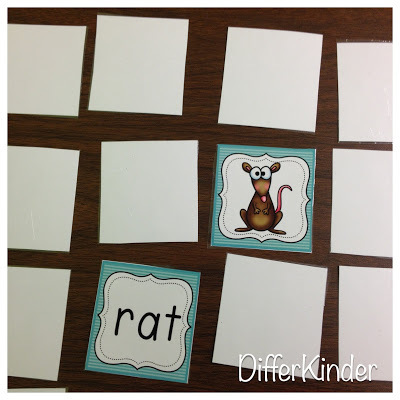 Memory Match: Played like traditional memory but students will match the picture card with the word card. Sorting Word Families: Place the sorting picture cards in a bucket, a basket or even in your sensory table with some seasonal shredded paper, pasta or rice. 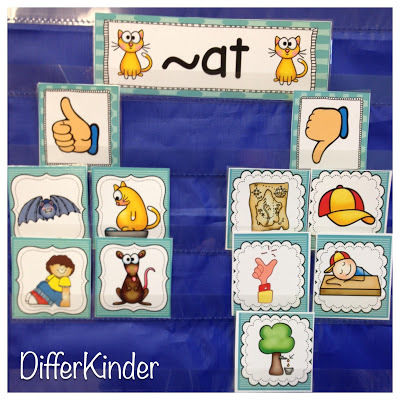 Students can sort the pictures into canisters labeled with a thumbs up or a thumbs down, indicating whether they are part of that word family or not. You can also have them do this in a pocket chart or onto ropes hanging from your ceiling. Be creative and make it fun. For students who need an additional challenge, have them record their findings on the word family sorting sheet. Word Family Hide n’ Seek: This activity gives your students an opportunity to practice reading word family words while playing a fun interactive game. 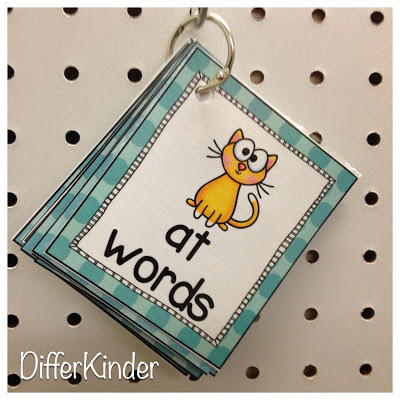 Place word family word cards in a small pocket chart. Behind one word card hide the picture above. Students then point at and read a word where they believe the picture is hidden. If they guess correctly, they get to hide the card next. You can use cards from more than one word family or just one word family. (You can find the playing piece in the ‘extras’ section at the end of this unit. 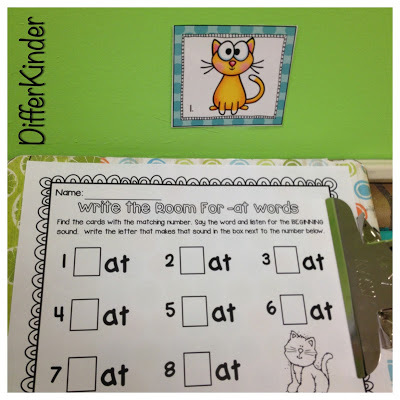 Write The Room For Word Families: Laminate, cut apart, and mount the write the room cards below with masking tape around your room. 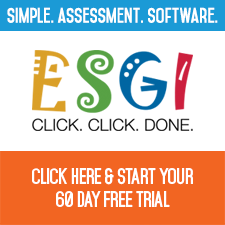 Based on your students readiness level, select a recording sheet for them to use. You may either laminate these (my preferred method) or print them off to use with a pencil if you prefer. 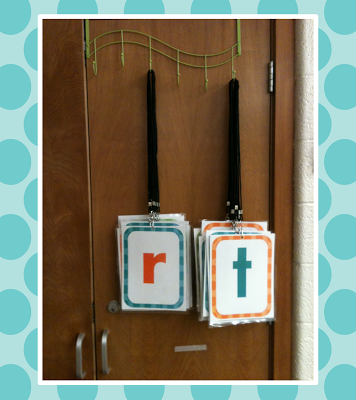 Hand your student a clipboard and have them search the room for the word family pictures. I have my recording sheets differentiated so that students are adequately challenged but not frustrated because the task it too hard. One level just has them entering the onset for the rhyme, another level has them writing the entire word family word and yet another level has them writing the word in the context of a sentence. Homework/Morning Work/Extra Practice I like to have the option of having something for students to take home for homework or just a little extra practice so I also provide some EXTRA differentiated printables including a differentiated word family slide, I-spy, word maze, Count, Graph and Write, and Say It-Make It-Write It sheets. Once my students have a couple of word families under their belts, I can add a few more games and activities to extend their learning. 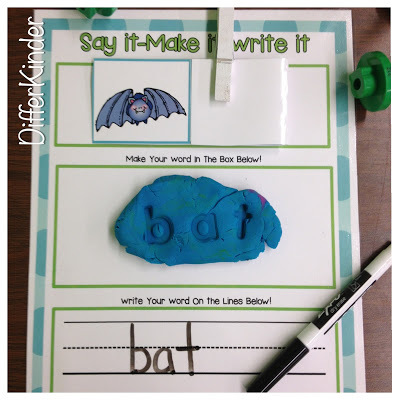 If you would like to see learn more about my word work, you can click on the picture below. I have a whole set of activities available (193 pages!!!) for letter ‘a’ and am working on completing the next vowel groups. 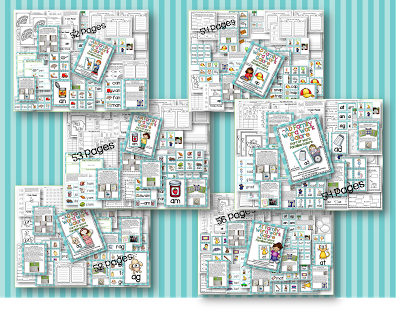 These sets are available as a bundle (6 weeks worth of Word Family Work in this set) or as individual units for you to pick and choose. I am SUPER excited about this!!! I will be able to use these when I go to 1st grade! Love this post! THANKS BUNCHES! Can’t wait to see the next sets! I love all of your different ideas for teaching word families  I’m going to try Daily 5 in September and I will definitely try some of your activities! This is exactly what I will be using in one of my word work stations for Daily 5 as well. 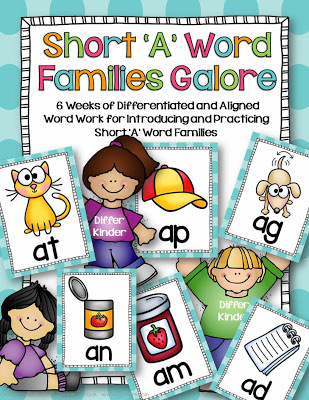 This is such a great packet – Short ‘A’ Word Family Word Work Galore Bundle. 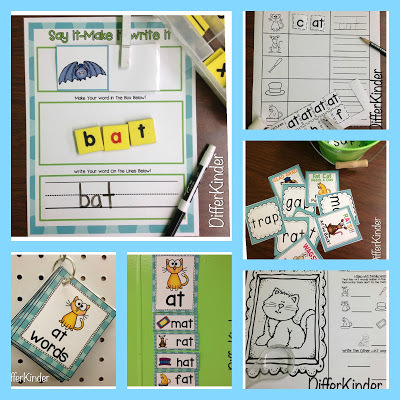 Are you planning on making similar packets for the other word families. I would so love it if you do. Yes, they are in the works. Keep checking back. I’ll be getting them done in the next couple of weeks. Thanks Lauren. I think word family work is just so important. I’m glad you think so too. This is fantastic! 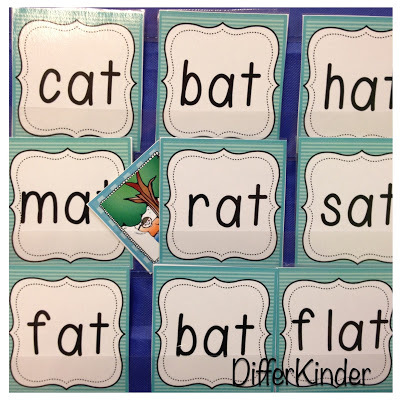 I have used a few of your self correcting stations/centers and my kiddos LOVE them (so do I!) Thank you for this…putting it on the wish list now! Thanks Andrea. I’ll be adding the other short vowel families soon. This is a wonderful packet for word families! Thanks for the schedule that you provided when introducing the short “a” families! Can’t wait to get started with these in the fall! Thanks and looking forward to more of the word families! Thanks Maryann, I’ll be working on the other vowel packs over the next couple of weeks. 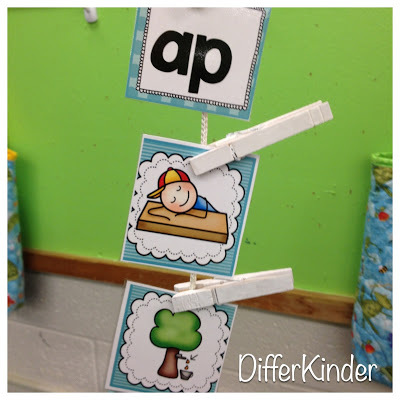 I love all of your center activities and now these word family activities! I was wondering, though, how you keep all of these activities clean when the students use whiteboard markers on the laminate. I tried some of the activities and I couldn’t get the whiteboard marker off. How do you do it? Thanks for all the wonderful ideas and products! I don’t have that problem any more. I only by really good dry erase markers and only black. If you use the colored ones they seem to be more difficult to work with in my opinion. Hope that helps. Thanks for your kind words abut my centers! Thanks, Marsha! You are such an inspiration! This is so gorgeous and so well organised. Can’t wait for the rest of the word families. This looks awesome Marsha!!! I am so excited to prep this over the summer!!! My new group of kiddos are going to love this!!!! What a brilliant packet. I’ve printed and prepped for the weekend. This will be great for my first graders. I have a few fluent readers and a few who say they can’t read. Obviously I need to work on confidence with those kiddos. I just wanted to thank you for creating such awesome resources. 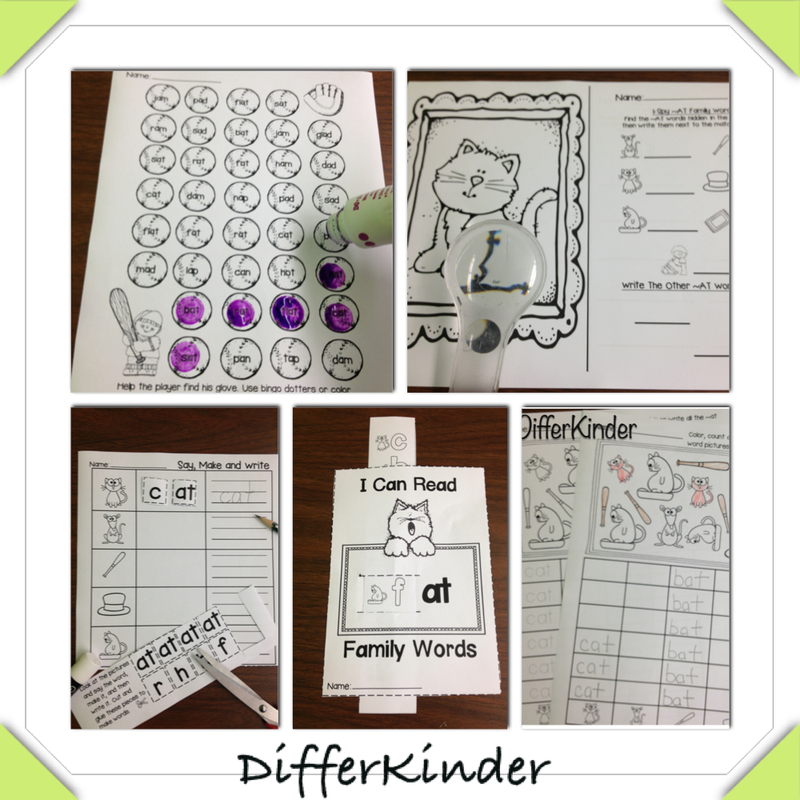 I homeschool my Kinder and we have such a great time with your word families. I purchased the bundle from TpT, our favorite is pick and keep if you can read the card! We can play for a long time depending on if you pick the “Rats all go back” card! 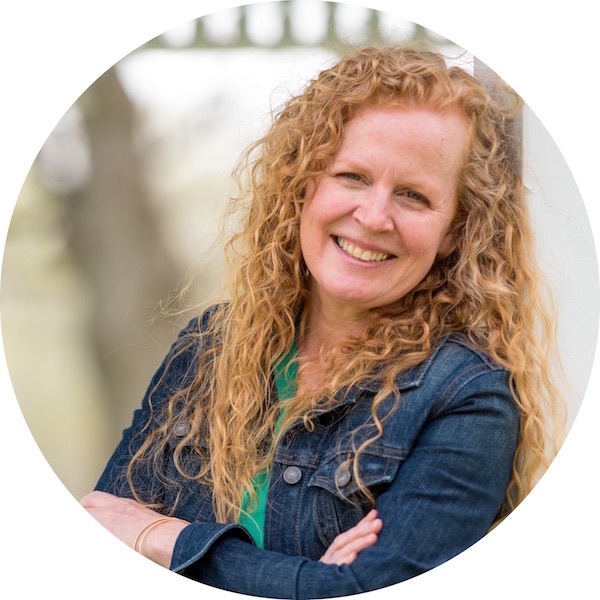 Anyway just wanted to thank you for making learning fun and engaging even for a homeschooling mom! Where can i find the activity where the picture is there they spell it with letters and then write it? These are ‘I Can Do It Myself’ activities that are located in my TpT store.